More broadly, Adri has over 25 years’ experience in the health and disability sector. She is the former leader of LIFE Unlimited, a national health and disability service provider. Adri also supported the implementation of the New Zealand Disability Strategy and has held governance positions within the national Needs Assessment Service Co-ordination Association (NASCA) and disability information services. Adri holds an executive Masters in Business Administration and in her career has received two business excellence awards. We are pleased to announce the 13th international Convention on Rehabilitation Engineering and Assistive Technology (i-CREATe 2019) will be held from 26-29 August 2019, in Canberra Australia. Into its 13th year, i-CREATe continues to provide an International platform of conference, Global Student Innovation Challenge, and exhibition featuring innovative technology, equipment, applications, techniques and materials applied in the field of Assistive & Rehabilitative Technology. It is also a stage for technical exchanges to share ideas and best practices in the disabilities field from across the countries. This conference, being co-hosted by the NZ Federation of Disability Information Centres and Assistive Technology Australia, will include a range of workshops on the types of assistive technologies available for use in education and employment. There will also be presentations by people with disabilities using technologies in their daily lives, including education, training and employment. Hear from people living with disability about how they are integrating new technologies into their daily lives. Network and exchange ideas with delegates from over 13 countries throughout Asia, Pacific and Europe. Have you considered presenting an abstract or workshop at this international event to showcase some New Zealand innovation on the global stage? Paper presentations & workshop proposals are focusing on the i-CREATe 2019 conference theme. The Southern Disability Information Advisory Service (DIAS) agreement for the West Coast was signed by Federation President Elinor Stratford and Corrina Gestro-Best, CEO of WestREAP, in Palmerston North this week. The West Coast DIAS service has been provided by two very capable home based Information Consultants but the service needs to grow in response to increased demand. WestREAP are providers of Education and Activity programmes and have extensive networks in the West Coast. Ms Stratford says "We look forward to seeing the innovative solutions they will bring to service provision, particularly in rural and remote areas of the West Coast." West REAP will take over from the 1st of July. The Federation is pleased to open Registration for its Annual Training Conference. Register now for this major disability sector training opportunity to be held in Palmerston North 21-22 May 2018. 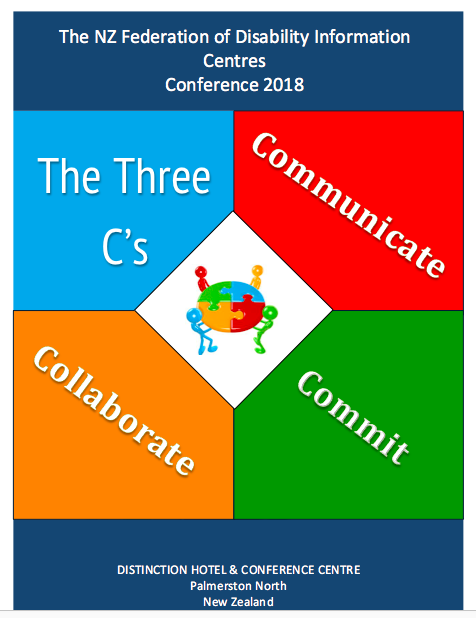 This Conference is open to anyone with an interest in working together to build inclusive communities using The Three C's: Communicate - Collaborate - Commit. The Federation is pleased to announce that its 2018 Training Conference will be held in Palmerston North 21-22 May. We now invite people to submit proposals to present to our delegates. You can download the Call for Presenters and guidelines HERE. Submissions are open until 28 February 2018. Disability Connect, a Federation Member Centre in Auckland, have produced some great resources that can be used to benefit and inform disabled people and their families. In a new initiative Disability Connect, in collaboration with cultural groups. the Northern Alliance and the Waitemata DHB, have produced a series of translated videos about disability supports. Available in English, simplified Chinese and Korean these videos provide information on everything from Diagnosis to Leaving Home options. A new Relationship Agreement between The Federation and NZ NASCA was signed in October. Federation President Elinor Stratford said that it was timely to acknowledge the intersect between Disability Information Advisory Services (DIAS) and Needs Assessment Service Coordination (NASC). NASCA President Sonia Hawea said that the document shows very clearly the common aims of both organisations in ensuring that consumers are at the heart service provision. Plans for shared activities and regular communication between the two entities are being formulated. Fantastic new video for the Rio Paralympics. The 32nd Annual Pacific Rim International Conference on Disability and Diversity will be held on April 25-26, 2016, at the Hawai'i Convention Center in Honolulu.